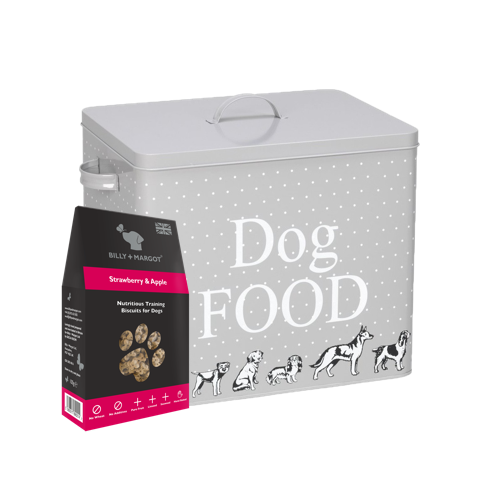 We have a great selection of the finest dog food and treats. Our range includes many baked-to-order dog treats that can be personalised with your dog's name or short message plus a wide range of low fat and gluten free dog treats. Most of our dog treats are made here in the UK by top bakers including Pooch's, Billy & Margot and Tribal. Dog treats can provide your dog with additional vitamins and minerals that may be lacking in his dog food. We have a fantastic range of natural dog treats all hand baked to order in the UK using the finest locally produced ingredients. We have top doggy bakeries like Hungry Hector, Poochs and Bertz baking delicious dog treats for us round the clock. Poochs even have some dog treats that are Gluten, Egg and Dairy free for doggies with sensitive tummies. Some of our luxury dog treats such as our peanut butter cupcakes and hearts can be personalised with your dog’s name or short message. We also have dog birthday cakes and birthday cookies that can also be personalised with your pet’s name.